I never thought I would post this recipe as I have never cooked it before this day. But somedays you just do the unthinkable. because some recipes are perfected over generations and all you need to do is to follow the path and keep the trust. Though I never made it but over the years I had gathered enough tips and tricks to make it from various TV shows and my blogger buddy, Amrita. 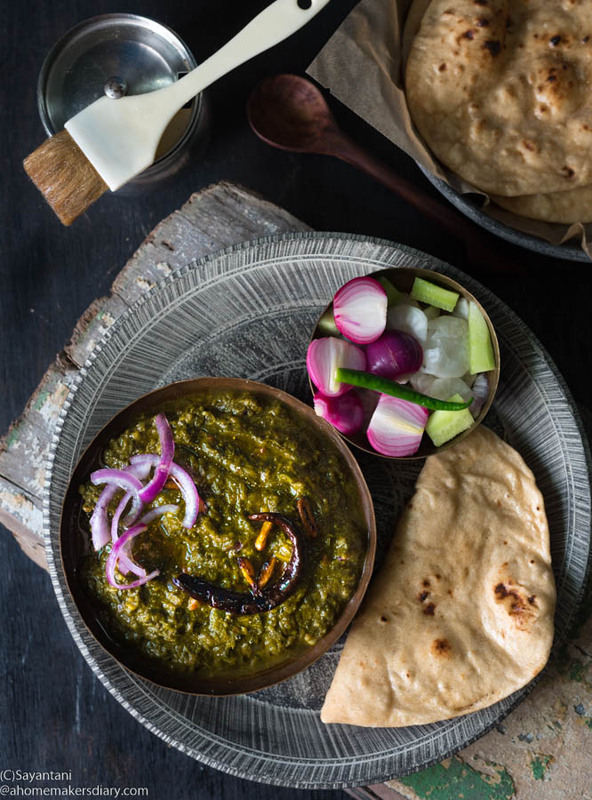 I especially loved Amrita's stories when she went to her ancestral home in Punjab and documented this recipe. The biggest tip was to use the stems or the dathal as they say in the local dialect. The recipe I followed belongs to Bobby Chinn's flavour cafe Asia which I noted down in my diary many years ago. I just love how he is so down to earth takes on everything with his great sense of humour. The dish was made in a remote village alongside a mustard field. 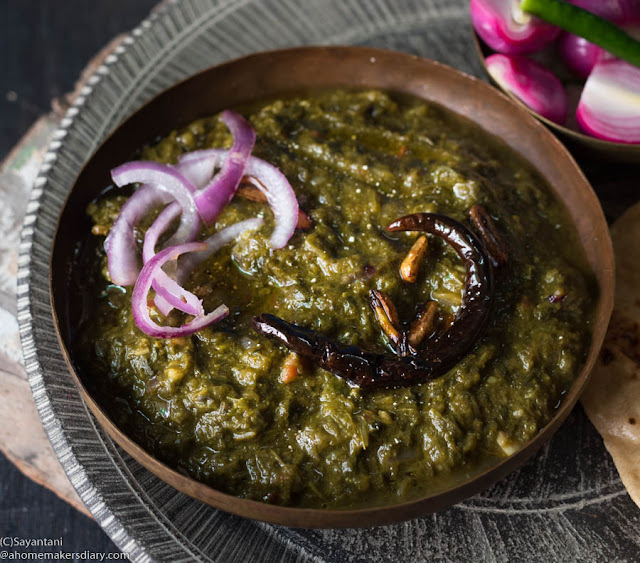 The recipe I believe is as authentic as it can get, made in a Handi and slow cooked for hours with pure ingredients, patience and love. Here is a no fail recipe for you to enjoy till these greens are available. Remove the roots part of the mustard greens and wash thoroughly to remove all the darts. Chop in 1/2" pieces. Include the stems and leaves all. Pick the leaves from the bothua and wash in three-four changes of water. In a pressure cooker place all these greens and 2 tbsp pounded ginger and garlic and 3-4 green chillies and little salt. Cook on medium-high for 1 whistle. Let the steam dissipate and then open the lid. Using a vegetable masher mash the shaag as much as you can. Switch on the flame again and if needed add 1/2 cup of water. On medium let it cook under cover for 8-10 minutes. And remove the lid halfway and mash again. 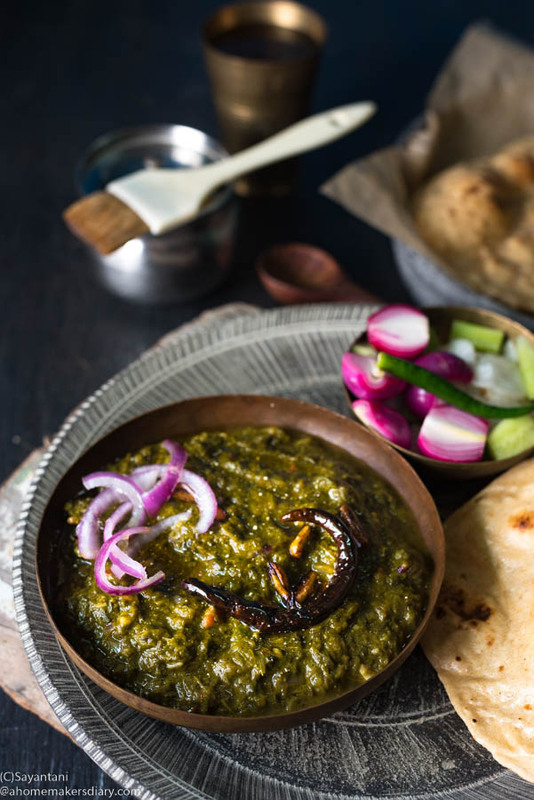 Do this for 15-20 minutes and the end the saag would be homogenous with a little bite here and there. Now add the makai atta mixed with 2 tbsp water. Mix and cook for 5 more minutes. Adjust the salt. Heat oil or ghee ( I used Mustard oil) and add the chopped onion with a pinch of salt. Let it turn golden on the edges and then add the ginger garlic. Cook for a couple of minutes and add coriander powder and mix. The chopped tomatoes go next. sprinkle a little salt on top and cover for it to soften. Once the tomatoes are mixed through (5-6 minutes) and oil starts to appear on the sides add the greens. Mix well and cook on low for 6-8 minutes. Adjust the seasoning and serve hot with Rotis of your choice and sirkewali pyaaj (onion salad). The usual ratio of the mustard to spinach and bothua is 2:1:1. that is 2 parts mustard, 1 part bothua and 1 part spinach. You can use either ghee or mustard oil or any oil. I loved the taste when it's cooked in mustard oil.